The first steps of an experience capitalization process include the selection of the case (or experience) to describe and analyse, a discussion about the purpose and the expected outcomes of the process, and the identification of those who are to participate in it. Most frequently, these are parallel and not necessarily consecutive activities. An experience can be chosen because that is where a particular group or project works (an “opportunistic path”) or because of the lessons that such a case might bring (a “strategic path”). These lessons may relate to the objectives or strategies implemented, or to the challenges which this organization is trying to tackle. While every experience can be described and analysed, it is important to remember that some can lead to more and better lessons, and are therefore more interesting. A group may find that it is easier to select an experience, or parts of an experience, on the basis of its unique selling point (USP): those specific characteristics which make it different from other projects being implemented in the same area or with the same objectives. Once identified, the team will need to set the boundaries of this experience, separating those parts of it which will be included in the process from those which, although interesting, will not be considered. The same team needs also to clarify the specific purpose of the process it is about to start, and to see how the whole initiative will fit within the set of activities that the organization is carrying out. When defining the objectives, they need to make sure not to mix the expected outputs and the expected outcomes of the process. Last, the team needs to think of those who are going to join the process, and of the ways in which their presence can lead to better results. A capitalization process is more effective when organized as a collective activity. The differences in opinions and perspectives of all those involved in an experience are an asset. More than trying to reach consensus, the process will have better results when the discussions help the team understand what exactly has led to these differences. By Laura Eggens. There are multiple ways of ‘doing’ experience capitalization. What were the experiences in the Ghana group that we could benefit from? And how could experience capitalization be of added benefit in each different participant’s actual working environment? By Laura Eggens. 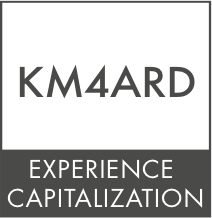 Why do an experience capitalization process? As discussed in Ghana, these objectives will help decide on the experience you want to focus on, and how to analyse it.